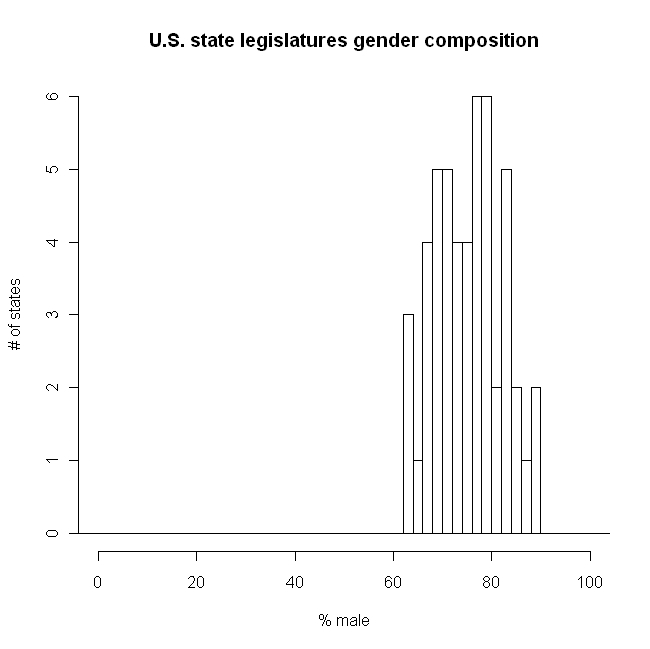 Women are heavily under-represented in all state legislatures in the U.S. Averaging over all states, women make about 25% of state legislators. The states which have the highest proportion of women in legislature are Colorado, Vermont and New Hampshire. In those states 37% of the legislators are women. 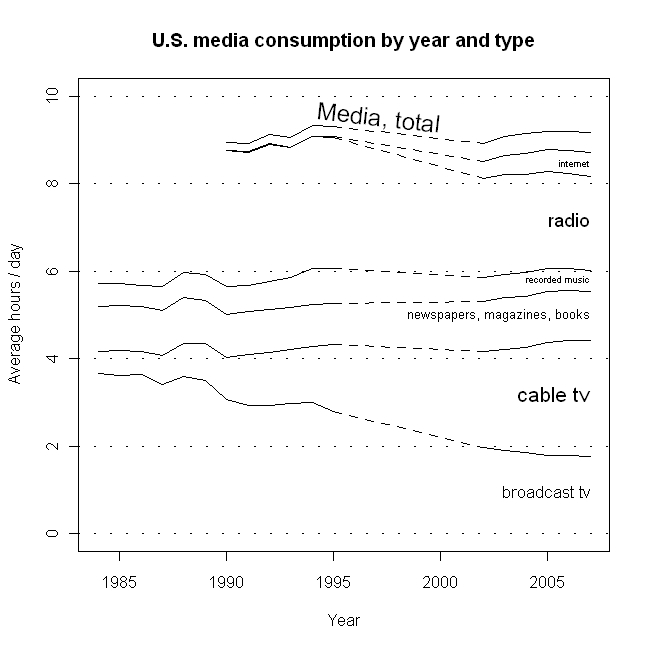 Average total media consumption time in the U.S. – about 9 hours a day – has remained unchanged since at least 1990, while TV consumption time – about 4 hours a day – has remained unchanged since at least 1984. Also essentially since 1984 unchanged are reading time – a little over 1 hour a day, and consumption of recorded music – about half an hour a day. The most noticeable change trends during the period have been the decline in broadcast TV viewing, all absorbed by increase in cable TV viewing, and the appearance of internet media consumption, with an offsetting decline in radio consumption. Note that the internet media category does not include consumption of TV or text news online, as long as the sources of those are not internet-only organizations. The media consumption categories not broken out on the graph are “video games” (about 14 minutes per day in 2007), “home video” (10 mpd), “movie in theater” (2 mpd), and “educational software” (80 seconds per day in 2007). Data source: The Statistical Abstract of the U.S. of the following years: 1994 (Table 884), 1997 (Table 886) and 2010 (Table 1094) [Data text file].